Home > TRY THE WORLD’S BESTSELLING SERRAPEPTASE…. FOR FREE! TRY THE WORLD’S BESTSELLING SERRAPEPTASE…. FOR FREE! As an exclusive treat for Serrapeptase – The Miracle Enzyme subscribers, Good Health Naturally are giving away a limited amount of their best-selling SerraEnzyme™ Serrapeptase health solution, which contains the finest quality Serrapeptase in a single quad strength tablet to target a wide range of health conditions. 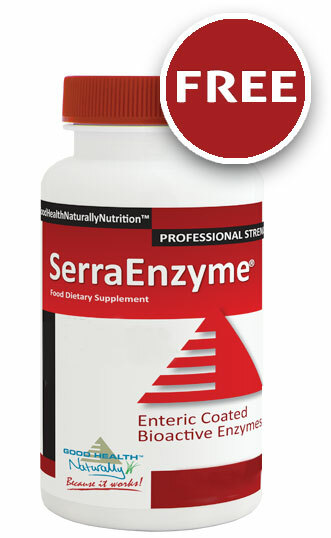 Thousands of happy customers have used SerraEnzyme with life changing results. *Free SerraEnzyme™ supplied by Good Health Naturally contains 90 capsules of 250,000IU Serrapeptase per bottle. This promotion is valid on retail orders only while promotional stocks last, and is limited to 1 redemption per customer/address. Shipping charges apply.